Sen. Marco Rubio (R., Fla.) has asked the Department of Justice to determine whether former Secretary of State John Kerry broke federal law by meeting with the Iranian Foreign Minister to try to preserve the Iran nuclear deal. Last week, Secretary of State Mike Pompeo blasted his predecessor for "actively undermining" U.S. policy by holding meetings with Mohammad Javad Zarif since leaving office. Pompeo called it "unseemly and unprecedented" and "beyond inappropriate." Kerry acknowledged last week he has undertaken rogue diplomacy without the approval of the Trump administration to encourage Iran to preserve the agreement with European countries. 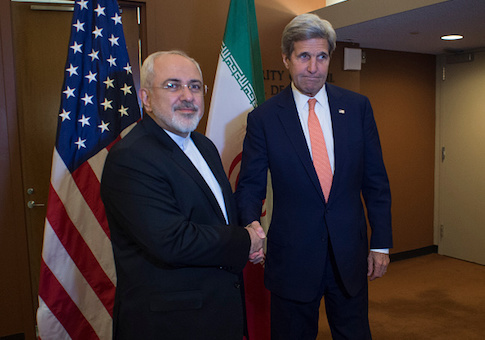 Kerry and other Obama administration officials believe the Iran deal, struck in 2015, was a landmark achievement. Kerry told radio host Hugh Hewitt he had met with Zarif in Munich, Norway, and other international forums, although not since Pompeo took office in April. He said he had criticized President Donald Trump for not negotiating with Iran, the world's largest state sponsor of terrorism. Trump withdrew the U.S. from the deal in May, reimposing sanctions and calling the agreement "defective." Rubio supported Trump's decision to withdraw in May, calling it a "bad deal" that paved Iran's path to a nuclear weapon. The Iranian economy has continued to sputter and businesses and banks have exited its marketplace since the reimposition of sanctions by the Trump administration. Rising prices and domestic discontent have led to wide-scale protests against the Iranian regime. This entry was posted in National Security and tagged Iran, Iran Nuclear Deal, John Kerry, Marco Rubio, Trump Administration. Bookmark the permalink.